Might seem hard to believe at this point, but there was a time in the late-‘90s to early-‘00s where big-screen Batman underwent something of an identity crisis. The creative folks behind the character's live-action iterations were unsure of whether to explore the character's dark, brooding elements from the comics -- something embraced by the wildly successful Batman: The Animated Series -- or return to the vibrant campiness of the ‘60s show, resulting in Schumacher's Batman & Robin and a period of silence afterwards. Sandy Collora knew what to do with the character, though, which led to his semi-independently-financed "fan film" Batman: Dead End, a moody and well-crafted ode to both the comic-book character and to creature-feature production design. How, then, could the craftsman behind such a regaled indie short full of action, reverence, and awareness of superhero filmmaking end up not becoming a larger presence in Hollywood? Behind the Mask: The Batman: Dead End Story reveals the how, and it makes perfect sense. 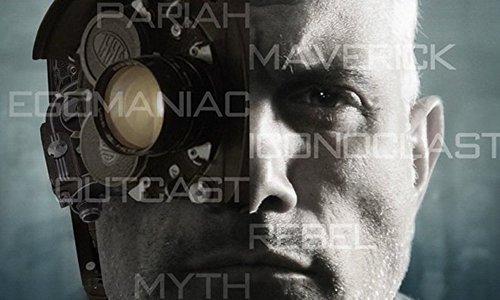 The front cover artwork for Behind the Mask features a silhouette of Sandy Collora's face with descriptive words flanking each side of him, accentuated with "visionary" and "myth" alongside "egomaniac" and "outcast", which sets a somewhat awkward tone. While the documentary was directed by Eric Dow, it was also produced (and Kickstarted) by Collora, which might understandably put one on guard in terms of the bias present in the documentary's storytelling. Behind the Mask cleanly separates into three general sections: the first part delves into Collora's growth in the film industry, primarily as a sculptor and production artist after he moved to LA in his late teens; the second part tackles how he transitioned from working under other people's design houses into the overarching Batman: Dead End project, with the hopes that it'd position himself as a noteworthy filmmaker; and the third part tackles both the reception to Collora's Batman short film and how he handled the attention afterwards. Behind the Mask devotes a lot of energy to fleshing out Sandy Collora as an professional, amplified by the interview time with him and many of the industry folks he's interacted with over the years, chronicling his time at Stan Winston's design house to his mentorship relationship with Henry Alvarez. While inspiring to a point, the depiction of Collora's story also comes across as a one-dimensional, starry-eyed story of an artist who took the plunge by moving from New York to LA and worked his way into the creature design processes involved with major productions (Jurassic Park, Men in Black, etc). There's a lot of laudatory talk surrounding Collora, framing him as a sort of determined and essential visionary -- someone who views James Cameron as the pinnacle of whom he should aspire to be -- without digging deeper into his personality beyond his enthusiasm for the craft. The documentary wants to get the point across that he's exceptionally seasoned and qualified, so much that the content almost feels like it possesses ulterior motives outside of merely depicting Collora's path toward Batman. Once the documentary arrives at Dead End, the scope of the actual conceptualization and creation covered about the short can be both satisfying and disappointing, especially considering how much effort was poured into the design and inspiration behind this mash-up of Batman and sci-fi alien villains. The content focuses quite a bit on Collora's ability to handle big properties and "what could've been" involving the casting -- a pair of high-profile names were originally attached to the Batman and Joker roles -- but it does also relish the small, jubilant successes of the production, such as witnessing the transformation of his second-choice actor, Clark Bartram, into a distillation of the shadowy, snarling versions of Batman from the comics. For a film labeled "the Batman: Dead End story", however, the extensiveness of what's covered from the actual production leaves something to be desired. Behind-the-scenes footage reveals glimpses at the stunt work and costume design, but it could've used some added verbal love and attention; the extras found on home-media discs offer more thorough insights. Some of the issues with the wavering focus on making Batman: Dead End falls on the documentary's structure, which makes certain to disperse its efforts between the before, during, and after timeframes surrounding the origin of the short film. Thus, a good chunk of Behind the Mask focuses on catching up on what happened to Collora after the short's attention-grabbing debut at San Diego Comic Con, why he didn't make it big and what he's done afterwards. There's a degree of candidness that's easy to appreciate at this point in the doc, in which Collora gets surprised by footage of his overzealous response to the audience's reception to a screening, and how that reflected upon his overconfident perception of how his career would -- should -- play out. Alongside imagery of his indie projects, both finished and in development, and discussion about an action figure that was put into production of one of the creatures from his short, Behind the Mask does land on a sobering, exasperating, yet inspiring note about the fruits of independence and passion as well as the pains of egotism and artistic rigidity. Too much energy funnels toward Collora instead of unpacking the Batman fan-film's construction, though.